There are two obstacles when it comes to training in evangelism. The first is inspiring people to want to be involved and the second is equipping people to be involved. Often the tactic has been to guilt people into doing evangelism and equipping them with one technique. As a result people have become burdened by the task of evangelism and are quick to retreat from it as soon as they can. How can we inspire people to want to evangelise and feel like they can evangelise? We need to help people understand that making disciples can be part of their day to day (“as they are going”) activities and conversation. 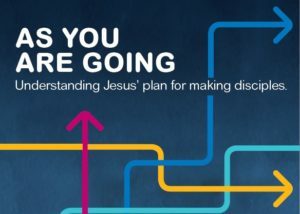 Making disciples in our post-Christian, post-modern world is for most of us a journey we walk with people over time – not a quick presentation of a few gospel truths. Every day and every relationship is an opportunity for us to show what life looks like with Jesus as Lord. Every day and every relationship could be an opportunity for us to speak of what life is like with Jesus as Lord. These studies have been written to inspire people to both want to share their faith and feel like they can do so when the opportunity arises. Part 1 of the booklet focuses on the impact we can have as we live authentic faith. Part 2 focuses on conversational skills to help us engage with the beliefs of our friends and allow a dialogue to develop. By competing Part 1 people will realise that the first step in evangelism is their own relationship with Jesus. After completing Part 2 people will have confidence to look for opportunities to enter spiritual conversations with gentleness and respect. Your church can choose to do either Part 1, Part 2 or both parts. For those outside of NSW & ACT you can contact your Crossover Rep for support in this area.